The Book of the Dead is a large collection of ancient Egyptian religious texts relating to funerals and the afterlife. The texts include spells, magic formulas, hymns, and prayers. The title is misleading. The writings do not actually make up a book but consist of many individual texts, assembled from numerous authors and sources over hundreds of years. Some of the writings are more than 4,000 years old. The Egyptians believed that their souls had to be judged by Osiris and many other gods before they could enter the afterlife. 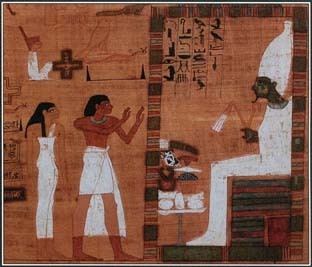 In this illustration from the Book of the Dead, souls stand before Osiris at the moment of judgment. The Egyptians believed that the texts in the Book of the Dead would protect and guide the deceased in the journey after death. The spells and magic words were supposed to give the dead person the power to overcome obstacles and reach the peaceful realm of the blessed. The spells served a variety of purposes. One spell helped the deceased enter the afterworld immediately after burial. Others enabled them to revisit the earth, restored their memory, and helped them breathe and eat. The Book of the Dead also contained the magical knowledge the dead needed to pass the judgment of 42 deities in the hall of Osiris, god of the underworld. Written on the walls of tombs and pyramids and on rolls of papyrus, the texts of the Book of the Dead were often accompanied by colorful pictures. The papyrus rolls were buried in the coffin within reach of the deceased or tucked into the wrappings of a mummy. Priests at the funeral would also recite many of the spells. See also Afterlife ; Egyptian Mythology .